What can you expect at a TinyTalk class? TinyTalk classes are run in blocks of 12 weeks, though you can often start at any time (subject to space). Each block covers the most important 50 core signs which we know will make a huge difference. 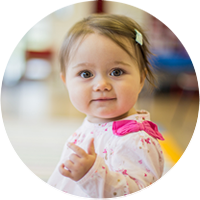 Our classes do not repeat across a year and, as babies' interests develop, so many families choose to return time after time. We cover 150 signs in all, and a few amazing babies have learned almost all of them! is a very happy, chuffed little being - DELIGHTED to be understood! And signing does NOT stop babies talking!